Follow progress on Twitter here. UPCOMING FEATURES IN GMODE V2.0! Contact me (MSN/PM) if you would like to test the alpha before v2.0 gets released as beta. [DONE] All ODE functions are compiled inside GMODE.dll. This means ODE.dll will no longer be used separately. Keep in mind this is just a beta. I did not focus on the features but stability and speed. Upcoming versions will include lots of speed improvements. Please report all the bugs and post suggestions for next release! Edited by Keth, 11 July 2010 - 03:51 PM. The EXE file attached inside the archive will work. You just won't be able to compile gm6 file. Wow, I've heard people say that GM can't handle 100 physical objects and maintain FPS. You had more. Great work. I really think it can use a fix for GM7 but it's fine for me. Edited by GMREC1111, 03 September 2008 - 08:50 PM. Edited by Keth, 01 May 2010 - 09:57 PM. neat, but you have a long way to go if you're attempting a full engine. two shapes that roll around isn't going to cut it. I have tried to optimize the physics using packed data (1 call per step for all bodies) but parsing the long string containing x,y,rotation for 100 bodies is a lot slower. The Gamemaker isn't that fast in long string handling. I guess this is the fastest way possible to do physics in Gamemaker. The only things left now are features I will work as soon as I will find some free time. Edit: I managed to optimize it 50% faster in 0.26 version. See physx_body_update script for details. Edited by Keth, 06 September 2008 - 09:37 AM. Refer to the bullet dll thread for tips on how to bypass GM's API speed issues. I get an Unexpected Error. Under GM7 and Vista. Thanks about the speed issue information. I think this might be faster way. Edited by Keth, 01 May 2010 - 09:58 PM. I see you've come to a good start, it's nice and simple. Just needs more predefined shapes and custom defining of shapes. Very nice work, I managed to get around 450 circles before it started to dip below 100FPS. Now you need to add support for rigid bodies of any shape. Can you also fix the counter, it doesn't reset. Use instance_count(object) to get it or reset each time you hit R.
Pretty cool. Might be useful once you update it more. Keep working on it. Ah, excellent! I am a very big fan of the ODE engine and use it almost exclusively in my developments. Steffen Itterheim has ported almost the entire ODE library to Game Maker back in 2004, and that's what I've been using since, but there are many flaws and/or errors with his dll and, well, he really doesn't come around here any more. So I look forward to your implementation and will be checking up for future updates frequently. Best of luck! This is amazing. Great job! I'll want to use it for my game, so I'm anxiously waiting for GM7 compatibility. Edit: Can we apply a force to a specific object, or create explosion effects, etc? Or is that a feature to be implemented later? Also, if possible, I'd suggest more options on how to dynamically affect the ODE "world" through Game Maker (eg set the x, y and rotation of a material). Edited by Paper Carnival, 05 September 2008 - 09:24 AM. please fix the memory leaks! Edited by them4n!ac, 05 September 2008 - 09:49 AM. Damn, I totally forgot about checking memory leaks. About PhysX, On the beggining I've been doing AGEIA PhysX with those functions but then I changed to ODE because doing 2D in PhysX was a lot harder. There is no memory leak. My memory usage for rigid_bodies.exe is static after creating 200 bodies (15,536 and doesn't change for 5 minutes). Have you been adding new bodies while the graph was going up? Edited by Keth, 05 September 2008 - 02:06 PM. Delete the bodies, and you'll see the leak. Memory allocation doesn't make the leak if that memory is freed after usage. Edited by them4n!ac, 05 September 2008 - 03:36 PM. Hmm, do you know if ODE has deactivating objects? As in, if it doesn't move for a while, it is cut out of the loop to not waste speed? Yeap, it does and I will add this feature soon. Edit: Added as a global for all bodies for now. I will be adding in future for given bodies aswell. Edited by Keth, 06 September 2008 - 09:34 AM. Okay guys, I have almost managed to create a trimesh shape. It's really hard doing it in 2D because the shape is done in 3D. The worst part (understanding the mesh data) is behind me. I noticed a bug. When I manage to immobilize the rope, it stays fixated to its current position, even when I apply a force to it with the left and right key. Removing the bodies won't make the rope move, unless I hit it with something. The only way to move it again is to hit it with another body. I don't suppose you figured out a fix for GM 7 yet? All the objects are disabled if they aren't moving. It's possible to set the minimum force to disable the body. Edit: It is supported now. Edited by Keth, 01 May 2010 - 10:01 PM. I just realized in half-way that ODE doesn't even support dynamic trimesh. So for now, I did static trimesh working. Edited by Keth, 01 May 2010 - 10:03 PM. then I don't understand you..
why you should try to make an unfinished and buggy 3d physics engine working like a 2d one? in my opinion, that's a waste of processor time..
First of all, as I said in first post it's still beta and I will be working on it so I have no idea why are you repeating it's not finished. Secondly, you have no idea how hard it is to find really easy 2D physics DLL. Not all the games got 3D physics but 2D as well. 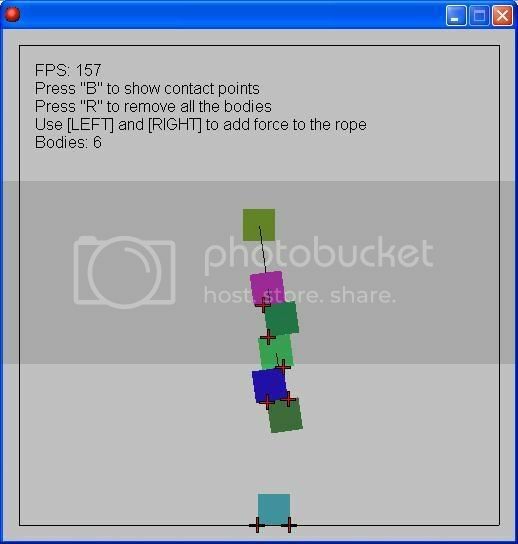 Thirdly, you should see games using ODE physics: http://ode.org/users.html. ODE is not that bad as you think. The only difference between calculating 3D physics and 2D physics is additional tangent calculation which makes 3D physics a bit slower. However, tangent is basically not used for bodies attached to plane joint. So the physics I made has nothing to do with 3D. btw, GMPhysics 2D is waste of time as well, isn't it? AGEIA PhysX is 3d. p.s. New version with new examples within few minutes. Edited by Keth, 01 May 2010 - 10:04 PM. Secondly, you have no idea how hard it is to find really easy 2D physics DLL. Not all the games got 3D physics but 2D aswell. Thirdly, you should see games using ODE physics: http://ode.org/users.html. ODE is not that bad. btw, GMPhysics is waste of time aswell, isn't it? AGEIA PhysX is 3d aswell. Hehehe. Actually, you can lock the z axis and make them work in 2d (like gmphysics must do). Same with gmbullet. And same with GMODE, am I wrong? I use plane 2d joint made espescially for 2D games (it locks to Z axis) so there is no difference between GMODE, GMBullet & GMPhysics. p.s. New update available to download (see first post). Edited by Keth, 21 September 2008 - 10:44 AM. yes, GMPhysics is the same waste of time. ODE isn't bad, it's just not for 3d, and not finished. 3d physics use another collision detection, moves everything in 3 dimensions. but I don't know what tangent calculation are you talking about.. I remember tangent velocity from collision handling which is projection of the velocity vector on an edge(2d)/plane(3d) of the other body, but that is used in 2d physics simulations too. Edited by them4n!ac, 21 September 2008 - 03:04 PM. In my opinion GMPhysics isn't waste of time because there are lot of games using it right now on GMC. You have no idea about physics engines. If you are going to do Box2D in Gamemaker then good luck! Gamemaker doesn't support SDK libraries (Box2D is SDK). Try looking for DLL physics engines which is the only way to use in Gamemaker. Collision detections are based on the same calculations for 2D and 3D and as I said, the only different is additional calculation for Z axis using tangent expression. To calculate the velocity from collision handling in X axis you use sinus. Y axis you calculate cosinus. These two calculations are used in 2D physics for calculating collision. However, in 3D physics tangent is for Z axis. Tangent is ONLY used for 3D projection and 3D physics. If your game has 2D physics and 2D projection then tangent is not used. p.s. tangent calculation is 3 times slower than sinus calculation because tangent calls sinus 3 times. It depends on optimizations of physics. I have no idea how to make this more clear to understand. Edited by Keth, 21 September 2008 - 06:35 PM. You look too inexperienced to make a physics dll. And it still can be faster. And that's the worst. Oh no, I do have. And a lot. I've made a particle simulation with continuous collision detection so the particles never ever run behind walls with any speed. As soon as Tutorial subforum will be opened, I'll put my ball physics example with sprite collisions using bounce function but controlling the power of friction and restitution. SDK is Software Development Kit, not a library or something like that. Try understanding the problem before saying "no". Do you have any idea what is sine, cosine or tangent? learn before talk such things. are you actually thinking what you're saying? can you prove your words? why do you think that could ever happen? tangent doesnt "call sinus" ever. Edited by them4n!ac, 23 September 2008 - 08:02 PM. Oh noes! You made particles . I didn't asked what you did and I have no idea why are you saying this. You haven't explained how you would implement Box2D into Gamemaker because that was my question. I didn't asked what SDK is. I said that SDK is not supported by Gamemaker and you said it is. Could you explain a bit more how you would use that? Also, SDK Library means that SDK is used as a library imported into application using collection of subroutines. Could you be nice and explain me what I have said wrong? In my opinion I do know what I am saying and you haven't explained me why I am wrong. Yes, I do know what I am saying and if you wan't a proof then your intelligence should prove it not me. Edited by Keth, 23 September 2008 - 10:51 PM. The results are equal but computer's processor has a different function for each math function and one is never using another. I would make a dll which uses it. And that's it. There's no magic. Learn programming in C++ good, and you'll know how to do it. - Yeah, Box2D is SDK, not a library, and not SDK Library. both are used the same way. Well, it's not my job really.. but I can try. everywhere I found "tan", it was in the word "Distance" either in the name of a function or in a description of the function. You give me your proof or I'll know that your words are nothing, just words without any knowledge about it. Well, it might be as you said but it doesn't change the fact that the calculation CAN be optimized and the calculation is wrong at all. That changes the fact. You said "Box2D in Gamemaker" not "Box2D in Gamemaker via DLL". Doesn't matter anyway I do get your point now. In Borland Delphi when you load SDK it says "Load Library". Maybe this made you to misunderstood me. Still, I have no idea who is right. You forgot about searching for ArcTan function which is used to calculate Z rotation axis. How? these trigonometric functions are at their maximum speed on every processor with the newest C runtime libraries. You're using ODE through your DLL, right? But you could compile it into your DLL and you would get increase in speed too. you were talking about "tan"
arctangent is "a different story". I mean optimization like calling sinus once and using it for tangent because this is what I meant from the beginning. It speeds up around 25% instead of using tan. That would be against the ODE GPL I think. Adding DLL into resources of application would result combining. Arctan is based on the same calculations as tan does - just backward. 1,000,000 times calling arctan takes 2.2 seconds. Edited by Keth, 24 September 2008 - 06:43 PM. 1. It was a sketch code. I didn't tested it in GM just Delphi with micro time and 25% is average of 10 tests ran. 2. Well, I find ODE more precise than Box2D. so, 0.055449 / 0.0772 = 0.71825 = 28% faster. Similar result I told in previous post. Edited by Keth, 01 May 2010 - 10:12 PM. 2. GM uses doubles and converts them to floats for Direct3D, that is one of the reasons GM is slow. btw, Box2D is easy to learn. Edited by them4n!ac, 25 September 2008 - 02:51 PM. But fun to play with! Edited by Billyro, 15 October 2008 - 07:08 AM. No it isn't. The cast is negligible. To use a double as a float in Delphi, I think you just need to round it. I agree that someone should make a Dox2D DLL but it would be extraordinarily hard, Box2D would need to be rewritten or coded so well that it would work. Box2D uses OOP and is static, it may be impossible to just wrap the functions unless you add more. The types prevent a lot too, you'd need to use an array and return index numbers. It gets hard. It's easier to use Allegro (Graphics) with Box2D in C++. oh, I said wrong. I just looked at the test results with my barely opened eyes.. I looked at one book now and did some tests, that's right, they are very fast. Edited by them4n!ac, 18 October 2008 - 11:15 AM. Ok ok, but let's not spam the topic. If someone tries to make something with Box2D, he will make another topic. I realize that this is an old topic and i'm sorry for bringing it back, but i'm using this DLL right now, and sometimes doing the smallest change in code make the game come up with an error saying "unknown variable (global.)_002". I have the physx_start and everything but i don't know what's happening. Even when i change the code back to how it was i get the same error. Anyone know why? Thanks! EDIT: I found out that even i declared global._002 in the create event of an object it still says that it's an unknown variable. So what could be causing this? Edited by heyufool1, 04 May 2009 - 02:39 AM. Is there any update for GM7 ? Edited by fhd, 20 August 2009 - 02:02 PM.